...and a different vantage point, technique and orientation. 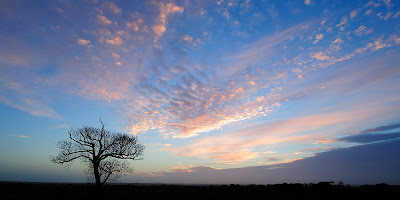 This time I decided to get much closer to the tree and use a wide angle lens (a 30 year old, battered 20mm f/2.8 Ai-S). Unfortunately the lovely mottled pre-dawn sky cleared before the sun hit it, due to the strong wind, so I switched to 'Plan B'. On went the much younger 24mm tilt/shift lens, cue panoramic format using the shift function. Lessons learned from recent morning trips: I ditched the wellies, favouring Fox Arctic boots instead... toasty toes means one less distraction from photos! Single gloves were replaced by a pair of thin grippy gloves (shame Lowepro have discontinued their 'Photographers Gloves'), with an oversized pair of Buffalo mitts over the top. I can forgive the giant comedy Kenny Everett hands for the warmth!